(Nanowerk News) A new catalyst created by U of T Engineering researchers brings them one step closer to artificial photosynthesis -- a system that, just like plants, would use renewable energy to convert carbon dioxide (CO2) into stored chemical energy. By both capturing carbon emissions and storing energy from solar or wind power, the invention provides a one-two punch in the fight against climate change. "Carbon capture and renewable energy are two promising technologies, but there are problems," says Phil De Luna, one of the lead authors of a paper published today in Nature Chemistry ("Theory-driven design of high-valence metal sites for water oxidation confirmed using in situ soft X-ray absorption"). "Carbon capture technology is expensive, and solar and wind power are intermittent. You can use batteries to store energy, but a battery isn't going to power an airplane across the Atlantic or heat a home all winter: for that you need fuels." De Luna and his co-lead authors Xueli Zheng and Bo Zhang -- who conducted their work under the supervision of Professor Ted Sargent -- aim to address both challenges at once, and they are looking to nature for inspiration. They are designing an artificial system that mimics how plants and other photosynthetic organisms use sunlight to convert CO2 and water into molecules that humans can later use for fuel. 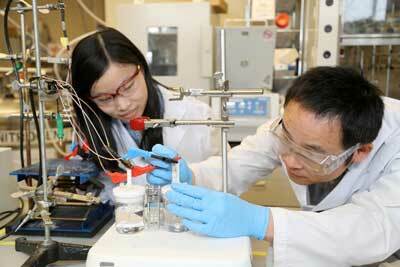 Researchers Xueli Zheng, left, and Bo Zhang test a previous catalyst for the artificial photosynthesis system. The new catalyst works at lower pH, leading to an improvement in the overall efficiency of the system. The team has now overcome this problem by developing a new catalyst for the first reaction -- the one that splits water into protons and oxygen gas. Unlike the previous catalyst, this one works at neutral pH, and under those conditions it performs better than any other catalyst previously reported. Armed with their improved catalyst, the Sargent lab is now working to build their artificial photosynthesis system at pilot scale. The goal is to capture CO2 from flue gas -- for example, from a natural gas-burning power plant -- and use the catalytic system to efficiently convert it into liquid fuels. The team and their invention are semi-finalists in the NRG COSIA Carbon XPRIZE, a $20 million challenge to "develop breakthrough technologies that will convert CO2 emissions from power plants and industrial facilities into valuable products." The project was the result of an international and multidisciplinary collaboration. The Canadian Light Source in Saskatchewan provided the high-energy x-rays used to probe the electronic properties of the catalyst. The Molecular Foundry at the U.S. Department of Energy's Lawrence Berkeley National Laboratory did theoretical modelling work. Financial and in-kind support were provided by the Natural Sciences and Engineering Research Council, the Canada Foundation for Innovation, Tianjin University, Fudan University and the Beijing Light Source. "Seeing the rapid advancement within the field has been extremely exciting," he says. "At every weekly or monthly conference that we have within our lab, people are smashing records left and right. There is still a lot of room to grow, but I genuinely enjoy the research, and carbon emissions are such a big deal that any improvement feels like a real accomplishment."